Here's where to watch every episode of El Chavo del Ocho season 6. Mouseover or tap an episode to see where to stream it. Click or tap the play icon to stream it on the best available service. El Cochino Jan 31, 1977 Don Ramón and Doña Florinda decides to become associates. Doña Florinda prepare the churros to Don Ramón sell them. But, when Doña Florinda started preparing them, El Chavo and Quico decides to help her, but they make an enormous confusion. Día De San Valentín Feb 7, 1977 Don Ramón has a piggybank full of money, and tries to hide it from Señor Barriga. Meanwhile, El Chavo and Quico dispute their piggybanks to see who has more money. Ramoncito (1) Feb 14, 1977 The neighbors celebrate Valentine's Day in Don Ramón's house. Ramoncito (2) Feb 21, 1977 Professor Jirafales gives to a Quico a dog, which he names as Little Ramón (Ramoncito). With the help of El Chavo and La Chilindrina, they bathe the dog. Then, the confusion starts. El ratón de Quico Feb 28, 1977 El Chavo discuss with Quico for being kicked from Doña Florinda's house for the trouble that they made. In the same time, Don Ramóm tries to protect from the boys, the table that he will use to sell churros. But he arranges a confusion with Doñ Florinda, because of the boys. Later, Professor Jirafales appears and his churros are stolen by El Chavo. Chavo siembra chabacanos Mar 7, 1977 Lost episode, can be watched in the Internet in Portuguese, in Brazil, it was transmitted from 1988 until 1992, when it was "substituted" by the 1974 version. Remake of 1974. Doña Florinda is obligated to give back Quico's dog, because it is prohibited to have animals in the vecindad. But, Quico believes that his dog was turned in watering can by Doña Cleotilde. This episode only exists in Portuguese. Don Ramón fotógrafo (1) Mar 14, 1977 El Chavo is planting Apricots to grow a tree of them. The problem is that he is soiling the courtyard, and even the neighbors. Later, Quico and La Chilindrina discuss because of their cotton candies, in the end, El Chavo and Quico plant coins to grow a money tree, but La Chilindrina get the coins and buy cotton candies. Then, El Chavo and Quico "plant" La Chilindrina to grow a tree of Chilindrinas. Don Ramón fotógrafo (2) Mar 21, 1977 Finally, Don Ramón is prepared to sell the churros. After many confusions, he asks El Chavo to watch the churros, while go to the bathroom. But when returns, discover that El Chavo eat all the churros. In the end, he assumes the blame from the boy. Don Ramón fotógrafo (3) Mar 28, 1977 Don Ramón encounters an old photographic camera, but El Chavo keeps tipping the camera. Later, the kids play that are photographers. El Chavo mata al Sr. Barriga Apr 4, 1977 Don Ramón is working as photographer and tries to take photos of Godinez in a park, but Quico is disturbing him. To worsen the situation, El Chavo keeps tipping Don Ramón's camera. La casita del Chavo Apr 11, 1977 El Chavo believes that killed Señor Barriga with a hit. Scared, the kids asks Don Ramón for help. But, this is a plan of Señor Barriga, that wants to scare El Chavo, since El Chavo keeps hitting him when he comes to collect the rent. But the confusion start, when Señor Barriga disguises as ghost in the middle of the night. Everybody, minus Don Ramón that knew about the plan, is scared, believing that is a thief. La canasta y los favores Apr 18, 1977 Quico builds a house to play. Meanwhile, Don Ramón buys new clothes and has a fight with Señor Barriga, that intimidates saying that if he don't receive at least one month of rent, Don Ramón will sleep outside. El Chavo explains where he gets the nickname "del 8". Los globos Apr 25, 1977 El Chavo learns with Professor Jirafales that we must share our things. Knowing that, Quico tries to share his balloons with El Chavo, but the two ends fighting. Meanwhile, Professor Jirafales has a problem with Doña Florinda because of a misunderstanding caused by El Chavo. El Chavo loco May 2, 1977 Don Ramón is selling balloons and have El Chavo to do all the popping when Quico gets it. But, when he thought that he could get lots of money, he discovers a problem: El Chavo don't understand his plan. Don Ramón carpintero (1) May 9, 1977 Quico and La Chilindrina believes that El Chavo is crazy when they saw him talking with the doors. Then, they decide to throw cold water in him, to cure him. But every time they try, they end up missing the target and hit someone else. Don Ramón carpintero (2) May 16, 1977 Don Ramón, working as carpenter, hits his fingers with the hammer all the time. Meanwhile, the kids decide to play carpenters. Then, they hit Professor Jirafales with the hammer all the time. Chespirito is in a cast which I'm 99.9% sure it's real because in an episode of Chapulin Colorado in the same time also has a cast. "Coincidentally" in the Dr. Chapatín short in this episode he also has the same cast. Albúm de estampitas May 23, 1977 Still working as carpenter, Don Ramón is forced to fix Doña Florinda's chair, that was destroyed by the kids. Then, he prepares a glue to fix the chair. Los sonámbulos (1) May 30, 1977 Don Ramón and La Chilindrina won a travel to Acapulco, thanks to the prize from a product to clean silverware that the girl acquired. Then, Doña Florinda, Quico, Doña Cleotilde and Professor Jirafales decides to go to Acapulco. Señor Barriga comes to collect the rent, only to discover that all the neighbors went to Acapulco. So he decides to go also. Affected with El Chavo, that would be alone in the vecindad, he decides to take the boy with him. Los sonámbulos (2) Jun 13, 1977 The characters decides to eat the breakfast in the club, where El Chavo makes an enormous trouble tipping the table of the breakfast. Quico dives in the pool, which leaves Professor Jirafales in panic, since Quico don't know swimming. Later, El Chavo pursues La Chilindrina through the club and keeps hitting everyone in his way. In the end, El Chavo sings "Buenas Noches, Vecindad"
Los sonámbulos (3) Jun 6, 1977 Arriving in Acapulco, El Chavo and Señor Barriga stay in a hotel. Later, in the pool of the hotel, El Chavo encounters Quico and La Chilindrina and the three causes a confusion with Don Ramón and Doña Florinda. In the end, El Chavo pursues Quico through the pool and causes an enormous confusion. La tubería rota (1) Jun 20, 1977 Quico and La Chilindrina buys an album of stickers of banknotes from the world. Meanwhile, El Chavo encounters dollar bills, that Señor Barriga had lost, thinking they are stickers. Knowing that, Don Ramón tries to fool the boy to get the money. 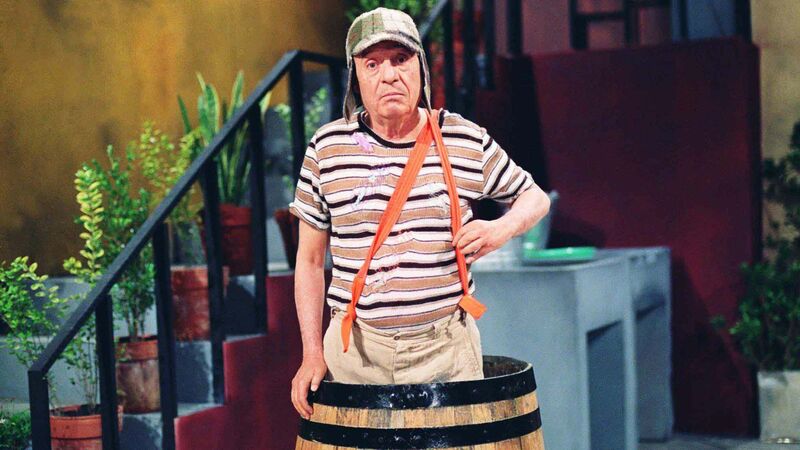 La tubería rota (2) Jun 27, 1977 Don Ramón is sleep walking and puts dishes every night in El Chavo's barrel because he is worried about the hunger of the boy. El cayo del Sr. Barriga Jul 4, 1977 All the neighbors are sleepwalking, including Quico and Doña Florinda. Don Ramón says to be careful, since can be dangerous to wake them. Electrocutados Jul 11, 1977 Doña Cleotilde suspect that it was a spirit and decides to make a seance in Don Ramón's house. Declaración del Prof. Jirafales Jul 18, 1977 There's a water shortage in the vecindad. Because of this, El Chavo, La Chilindrina and Quico are asked to go to the other vecindad to get more water. And the confusion starts when the neighbors argue over the buckets of water. Aguas frescas (1) Jul 25, 1977 The vecindad continues without water and the neighbors refuse to pay the rent to Señor Barriga. Then, when the problem with the pipes is resolved, El Chavo has the idea to throw the buckets of water away. With this, he hits the neighbors with water all the time. Aguas frescas (2) Aug 1, 1977 El Chavo hits Señor Barriga on the foot, which makes an enormous callus. Meanwhile, Quico signs a "voucher" of one million pesos to El Chavo, which he then believes that he is a millionaire. Aguas frescas (3) Aug 8, 1977 Don Ramón and El Chavo wants to see the soccer game in the television, but the electricity ran out in the vecindad. Furious, Don Ramón destroys his television. The problem, Señor Barriga took all the fuse due to the renters' back rents. Don Ramón decide to repair the TV and, while trying to connect the wires, he is electrocuted and the same happens with other neighbors. Confusión con la carta Aug 15, 1977 Professor Jirafales wants to declare his love to Doña Florinda, for this, he asks help for Don Ramón. But the kids believes that the two are dating, and the confusion starts. Regreso de Chilindrina Aug 22, 1977 El Chaves begins selling juices, but the business don't go well. And to make things worse, Quico becomes his biggest rival in the juices business. But he somehow gets enough money from Señor Barriga after he knocks all the juice down. Quico tries to do the same thing but ends up with a business card instead of money. La caja de madera Aug 29, 1977 Quico becomes a great customer of El Chavo's juices. Later, Don Ramón tries to escape Doña Florinda and Señor Barriga. Taking the opportunity, El Chavo makes blackmail to Don Ramón buy his juices. He also try to subdue Señor Barriga. Los dibujos de los niños Sep 5, 1977 El Chavo continues with his juices stall. Meanwhile, Don Ramón is with insomnia. Doña Cleotilde wants to help and buys a powerful syrup to free him of the problem. But the kids believe that is to to put a spell on him. Pintar la vecindad (1) Sep 19, 1977 After a weekend out, La Chilindrina is back! Upon arriving, starts making trouble: steals the blowpipe and the pellets of El Chavo and starts hitting everyone, causing an enormous confusion. In the original version, had long been Chilindrina with her aunts and that is why Don Ramon gets so excited to learn that she's back. In real life Maria Antonieta had been away for good while.In this version Maria Antonieta was not cast missing and to justify the plot, they specify that she only went to spend the weekend. That's why Don Ramón reacts quite normal when he knows that his daughter comes. La pancita Oct 3, 1977 The kids make drawings in the school, but Professor Jirafales wants to know who made his caricature. Frightened, Quico asks El Chavo to assume the responsibility of the drawing in exchange of a ham sandwich. Don Ramón deja la vecindad (1) Oct 10, 1977 Quico buys a toy flying saucer. Meanwhile, Don Ramón makes a plan with El Chavo, to everytime that Señor Barriga appears, the boy shouts "It's Here the Flying Saucer!". But, the plan don't go well. Don Ramón deja la vecindad (2) Oct 17, 1977 The neighbors wants the vecindad painted and asks Señor Barriga for this. At first, he accepts, but after a confusion with El Chavo and Don Ramón, that don't paid the rent, he quits. Later, Professor Jirafales has the idea to Don Ramón paint the vecindad in exchange of some months of the rent. Everyone likes the idea, minus him. Los guantes de boxeo Oct 24, 1977 The neighbors starts cleaning the vecindad, to paint later. Everyone decides to help, after everything is done, the neighbors are satisfied, including El Chavo, that paints his barrel. Jugando a la comidita Oct 31, 1977 Doña Cleotilde prepares pancakes for Don Ramón, but La Chilindrina eats all pancakes alongside El Chavo. Quico takes the blame. Que Bonita Vecindad Jul 11, 1977 The Señor Barriga decides to evict Don Ramón, after many months without paying the rent. Quico encounters the old album of pictures of Don Ramón and starts remembering the old days, like when La Chilindrina was a baby. First appearance of Doña Nieves (Ma. Antonieta de las Nieves). Remake of 1974. La canasta y los favores Jul 14, 1977 The neighbors continues seeing the pictures, remembering of days like when El Chavo arrived in the vecindad and when Quico's dad, Frederico, go to his last voyage. The Señor Barriga sees a photo of Don Ramón when he was a boxing fighter, affected, he invents a story, to keep him and La Chilindrina in the vecindad. In this episode they recall when Chavo comes to the neighborhood when he was a baby and they also remember Federico (Quico's father). Los Guantes de Boxeo Nov 21, 1977 Don Ramón remembers of the days when he was a boxing fighter. Later, he sees El Chavo fighting with Quico and believes that he can be a great boxing fighter. Don Ramón tries to teach him, but this causes problems with Professor Jirafales. El Casimir Nov 28, 1977 Don Ramón decides to exchange a cheap cashmere with Señor Barriga, lying that the cloth is English. Later, El Chavo, La Chilindrina and Quico gets the cashmere and make a picnic with it. But, El Chavo soils the entire cloth. La Vecindad del Chavo Dec 5, 1977 Professor Jirafales decides to teach music to his students. Later, decides to play of orchestra in the school. In this episode, the characters sing: "Joven Aún" and "¡Qué Bonita Vecindad! ".This episode is almost identical to La Orquesta (1973 and 1976) regarding the script. However, this is at school and with the music videos. Joven Aun now has Dr. Chapatin. ¡Qué bonita vecindad! Professor Jirafales decides to teach music to his students. Later, decides to play of orchestra in the school. In this episode, the characters sing: "Joven Aún" and "¡Qué Bonita Vecindad!". DUPLICATE After losing his dog, Quico buys a mouse, which scares everyone. The neighbors try to get the mouse, which causes lots of confusion. DUPLICATE El Chavo, Quico and Ñoño are playing baseball, which causes many confusions in the vecindad. In this episode, El Chavo gives 20 cents to Don Ramón pay the rent. (from Season 3 description).